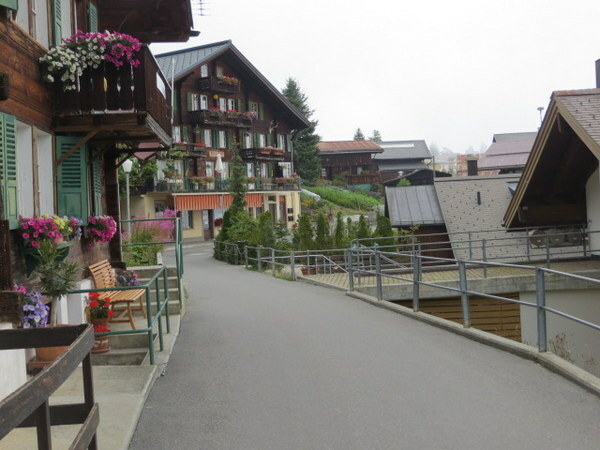 We were enchanted by The Lauterbrunnen Valley in the Berner-Oberland of Switzerland when we visited last winter (see New Year New Country), so upon our return to Rome in January we decided we needed to see the area without snow. Our return trip happened over American Labor Day weekend. What a beautiful area, with wildflowers blooming, snowy peaks, and perfectly clean little towns! What was really fun was to experience the differences between the area in the two seasons. Obviously snow versus no snow was a huge difference, although our last morning we awoke to a temperature of 36 degrees Fahrenheit, and new snow in the mountains: a bit nippy for September 1. We also found the crowds to be significantly less. Gondolas were never full. Trains were never full. 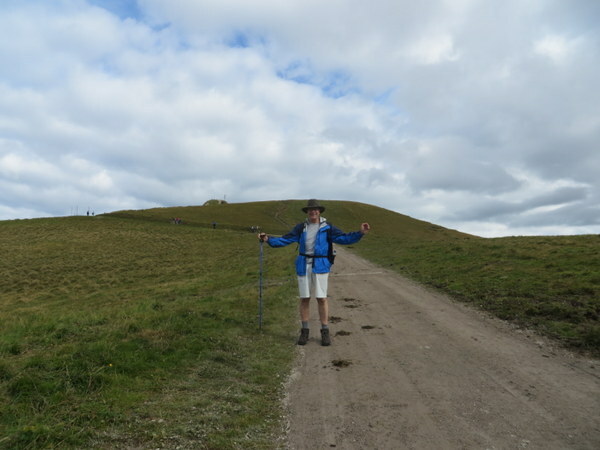 Trails were no more crowded than in winter, and restaurants were sparsely attended. 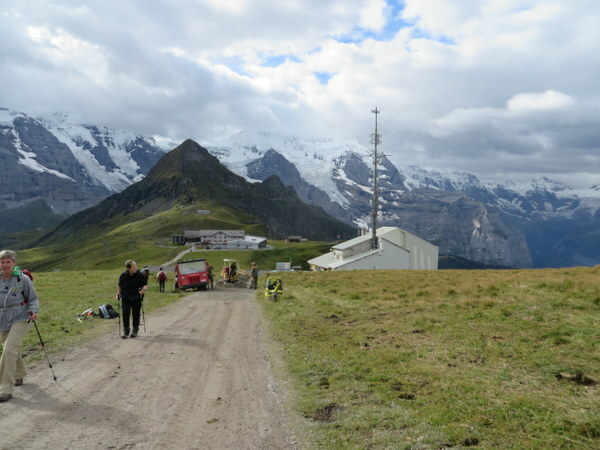 We thought summer would be high season, crawling with people but were delighted to find little Mürren uncrowded. Mannlichen is above the Lauterbrunnen Valley, reached via gondola and is a great ski area in winter. Mannlichen summit in summer, similar perspective. Gondolas ferry hikers. 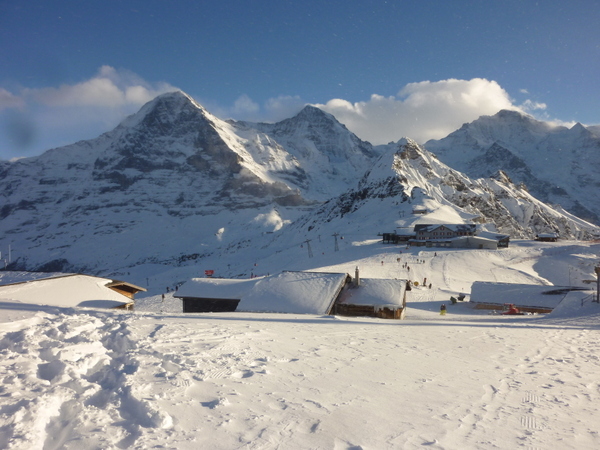 Kleine Scheidigg is the jump off point for skiing in winter, and the train to the Jungfraujoch year-round. Sames trains, but fewer people in summer, at least when we were there. An interesting contrast was the make-up of the traveling population we encountered. 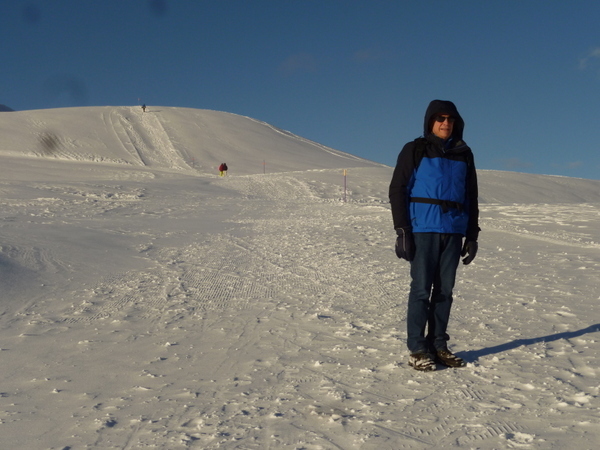 Last winter there were hundreds of Japanese tourists. 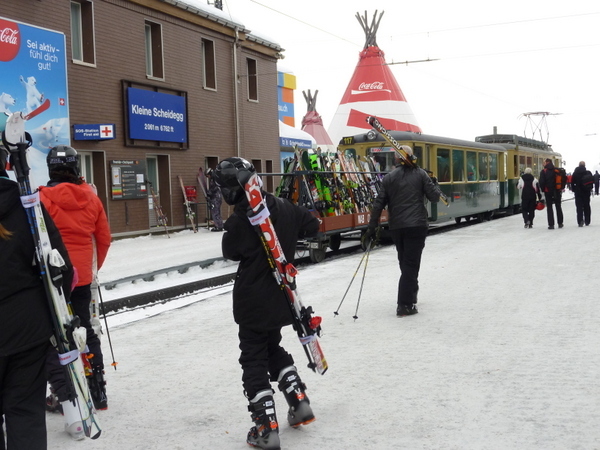 They did not seem to be among the skiers, but were happily riding gondolas and cog railways to experience the view and the snow. In summer we found more Swiss from other parts of the country enjoying the area, some folks who were dressed much like the Amish in America (they might have been German), and an amazing number of people we presumed to be from Islamic countries based on the dress of the women, which ranged from a simple hajab to abaya and niqab. We do not see this much in Rome, so I was surprised to see so many observant Muslims dressed so in Switzerland. We also saw or met many Chinese, a few Japanese, some French, some Americans, Canadians, an Israeli, but no Italians at all. I must say Switzerland is more expensive than Italy, so no doubt the Italians prefer the Dolomites. 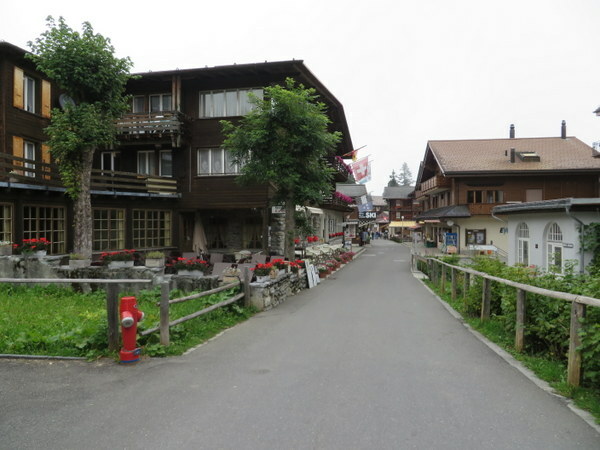 In Mürren we found a ½ bottle of wine was upwards of €25 (about $32) in a restaurant. A simple dinner of pizza, wine and salad was easily €62, about $80. In Rome, we can eat the same dinner for as little as €35 ($45). At least visiting Switzerland made us feel better about prices in Rome, as bad as they can be. A rare photo together. A nice Swiss family we met snapped this for us. If it wasn’t foggy you’d see amazing mountains behind us. 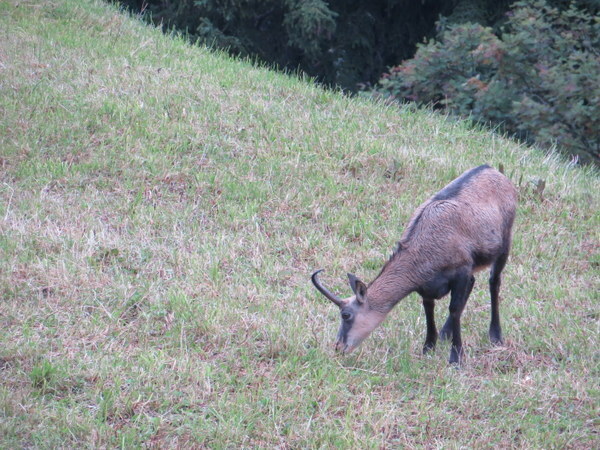 Chamois grazing near Murren. They hang out along the narrow gauge rail line then bound off when the train comes. 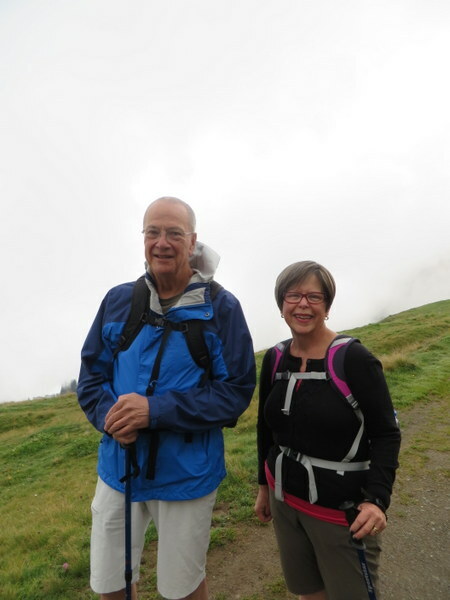 We would like to hike in Switzerland again, but will probably choose a self-catering apartment and cook some meals. That’s a real contrast to our usual mode of travel! 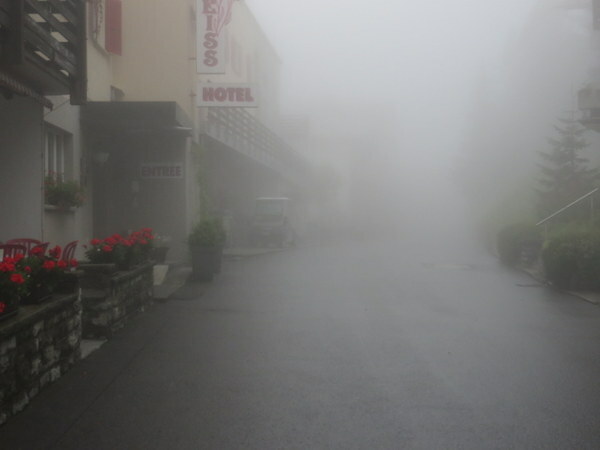 One morning we woke up to dense fog, but the other side of the valley was fine. 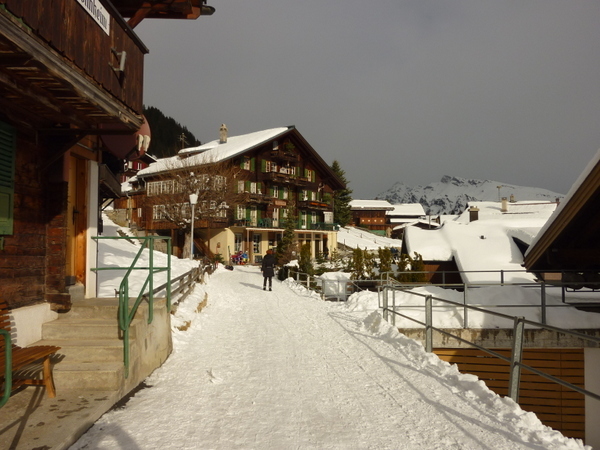 Murren is a very pretty, serene town, but not easy to reach: 5 trains and a gondola lift from Rome to Murren. 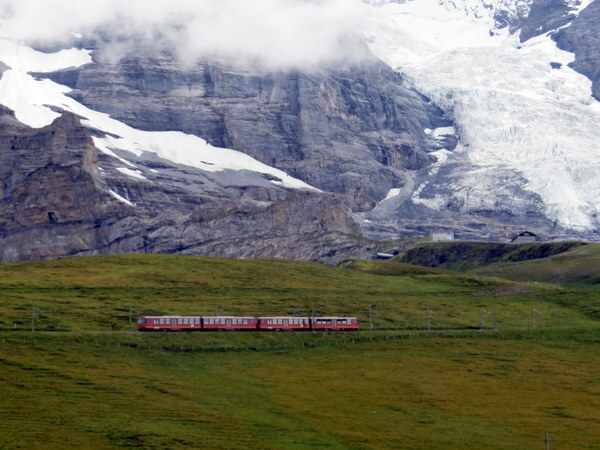 The Jungfrau Railway “Top of Europe” attracts THOUSANDS of visitors each year who pay upward of $200 to take the ride. 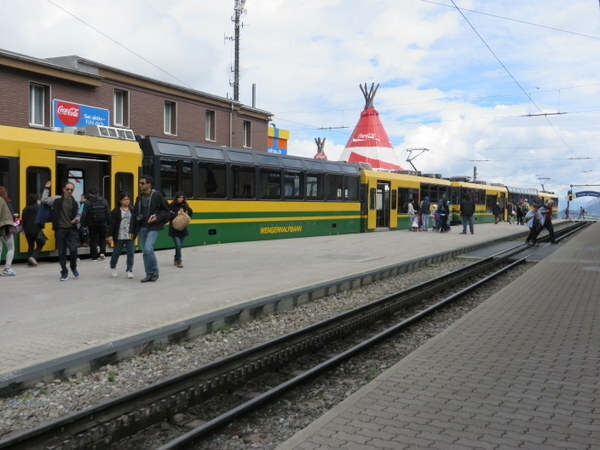 This is the little train that chugs to the highest railway station in Europe. Many people come here solely to do this and neither hike nor ski. Maybe next time for us. 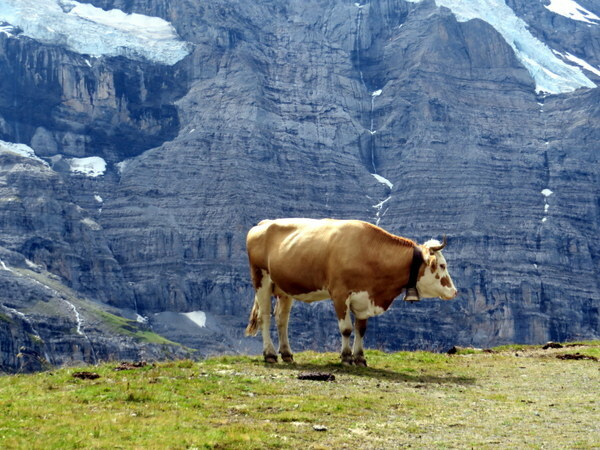 We frequently hiked through grazing herds of cows.